Dr Monah Mansoori joined Courtfield in 2014. 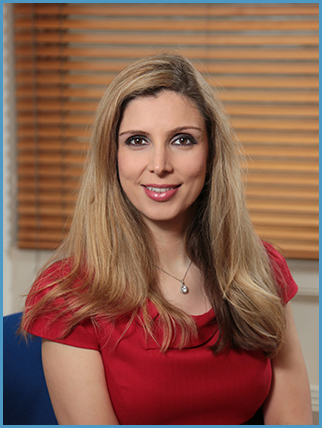 Originally from Newcastle, she graduated from Imperial College School of Medicine in 2004 and completed her GP training at West Middlesex Hospital, achieving her Membership to the Royal College of General Practitioners in 2010. She has a special interest in skin conditions and completed the Postgraduate Diploma in Clinical Dermatology at Queen Mary University London in 2011. She is also trained in skin surgery and other surgical procedures for medical and aesthetic uses. In 2018 she opened the Dr:M Skin Clinic at Courtfield to provide a wide range of both aesthetic and medical dermatological treatments. For details of all her treatments please go to www.drm-skin.com. She also has a particular interest in holistic health, in particular, how lifestyle factors, such as nutrition and psychological wellness, can affect our long-term wellbeing. Outside of General Practice, she works as a media doctor providing live commentary on health stories for television, radio and written media. She is most often seen as one of the resident doctors on Sky News and also appears regularly on Channel 5 News, ITV News and also the LBC and BBC London Radio stations. She has worked as part of the team on the Channel 4 “Embarrassing Bodies Live from the Clinic” programme and also featured as one of the resident doctors on ITV’s “This Morning”. Monah is also an ambassador for the Eve Appeal, a charity raising funds for research and awareness into gynaecological cancers. Monah is married and has a young baby, so understands the stresses and strains that new mothers face. She enjoys baking and various sports, particularly tennis to a high level. As a student and young doctor, she worked as a tennis coach.